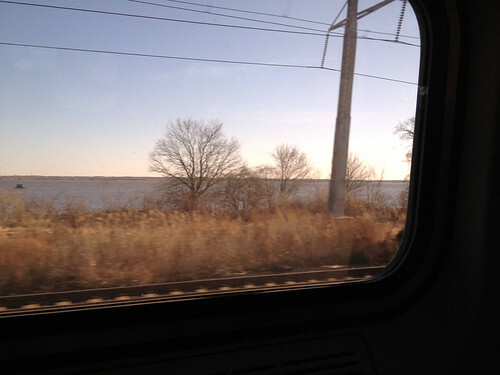 I went down to Virginia to visit my family over the holidays – traveling by train, which is really the most comfortable and civilized form of travel these days. You don’t have to show up early, there’s no security line to deal with, you get plenty of leg room, electrical outlets, wi-fi, and they have a “café car” where you can order food. 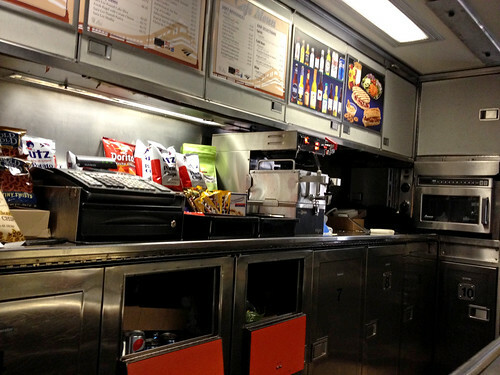 This café car happens to have a veggie burger – so, although I was wary of what the quality would be (as nice as Amtrak’s amenities are, no one expects food cooked in a microwave oven on a moving train to be five star quality) I was determined to try it – for the sake of the blog! 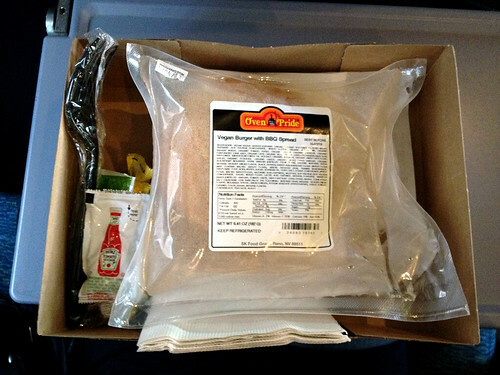 The “Vegan Burger with BBQ Spread” came sealed in the same plastic bag that the café car employee had microwaved it in. The ingredient list was rather terrifyingly long, but did indeed appear to be vegan as the name claimed. I carefully opened it up, revealing the fully assembled burger patty sandwiched on a bun inside. The taste was shockingly not terrible! 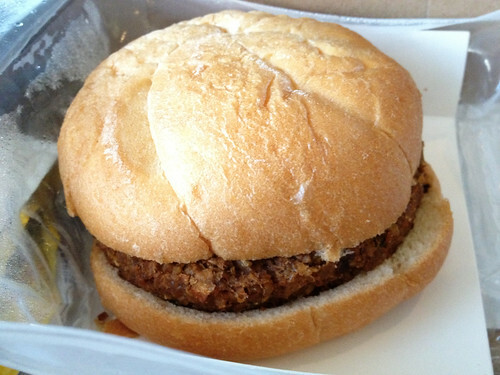 It was actually better than the usual infamous “hockey puck” veggie patty I had been expecting. The texture and flavor were definitely a step above that. It was chewy, a mix of different grains and other bits of vegetables and things. Not really trying to be faux-meat. And the BBQ Spread was pretty good too – the barbecue flavor dominated the whole burger, I’m not sure what the patty’s taste would have been like without it, but I’m a barbecue fan, so I was satisfied. The sauce had soaked into the bun completely, so I would have liked a little extra sauce (burgers should be juicy and drippy, right?). The bun itself was soft and chewy. Of course some nice crisp lettuce and a slice of tomato would have been ideal too, but I guess that would be expecting a little too much. All in all, it was still fast food made on a moving train – but it was still better than I expected it to be! I still prefer picking up some takeout before catching a train, but if you are in a rush, or stuck on the train for so long that you’re just dying for a warm meal, it’s not a bad option. And major props to Amtrak for having a clearly labeled vegan option on the menu, too! I was quite impressed by that alone. 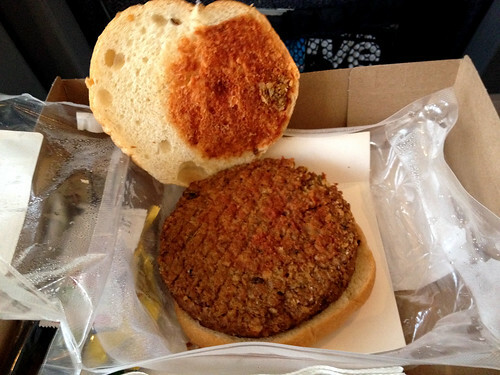 I was traveling on the Northeast Regional from NYP to CVS– I do not know if the same burger is available on all Amtrak trains. Glad to see there was a vegan option on the train, but bummed about the epic paragraph of ingredients. Those sliders you had from Chickpea & Olive on the hand, look badass. yes, definitely try the Chickpea & Olive sliders if you get a chance! They're on twitter too if you want to follow them and find out where they'll be serving their delicious food next.